Check-in is easy and intuitive. Some of the fields require specific information or pre-defined options. These are covered in this document along with tips and hints. 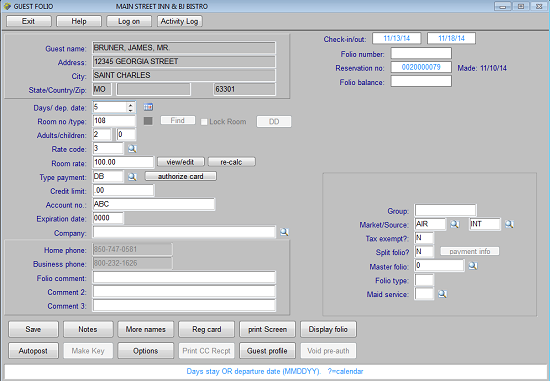 Click on the Check In icon at the top of the main Hotel screen or go to Front Desk > Front Desk Operations > Check In. 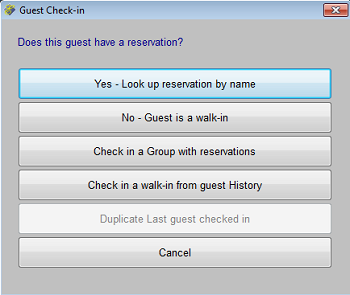 This will take you to the Guest Check-In selection screen with the prompt, "Does this guest have a reservation?". Click "Yes – Look up reservation by name." The guest was late and didn't arrive until 3:00 AM but you will charge them for the previous night. The guest is checking in early at 7:30 AM and will not be charged for the previous night. NOTE: If you answered 'Yes' and the Night Audit "Post room and tax" has already been run, you will need to manually Post Room and Tax. When asked if you would like to post again at Night Audit, be sure to answer 'Yes.' If you don't, the Night Audit will assume that the posting applies to the current business day and it will not post for that night, leaving you short one day of charges. The Guest Profile screen will appear. (Depending on your settings, your system may skip the Guest Selection screen show above and go straight to the Guest Profile entry screen shown below.) Note: Some systems do not have the Guest Profile feature. This feature can be enabled or disabled but it is a global setting, not per guest. If the profile is correct, click Save to proceed with the check-in. If "Save" is highlighted you can press Enter to proceed. Note: If you change the guest name, a warning will display. 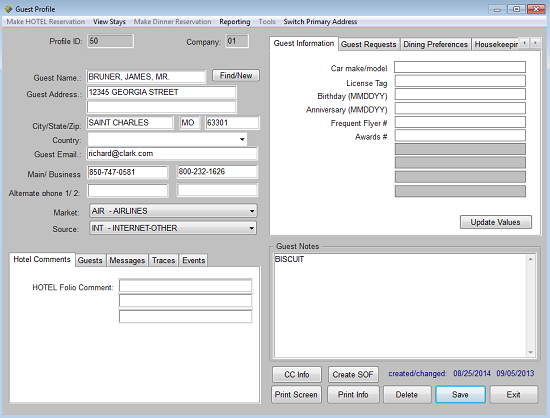 You should NEVER change the guest name except to correct it or add more information. 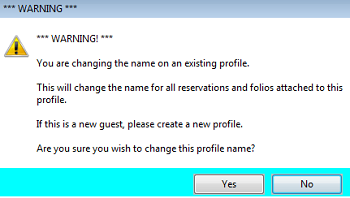 If you selected the wrong guest, do not change the name. Click the "Find/New" button to select or create a different profile. See also Guest Name Changes-Profile . Verify that all of the information for the guest is current and correct. Click Save to save the profile and exit the profile window. This will take you to the Guest Folio screen to complete the check-in process. 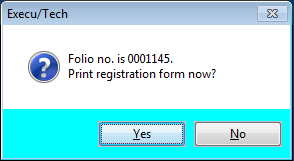 The folio will default to the number of nights as determined by the reservation. You may change this if availability permits. 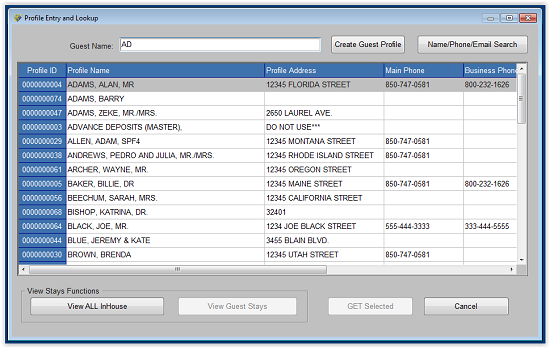 The folio will default to the room number if entered in the reservation or the room type entered in the reservation. You may enter a room number or click the magnifying glass lookup icon, or type ? Enter to look up available rooms. If you click Find the system will find the next available room based on occupancy and search priority settings as determined in the Rooms setup. 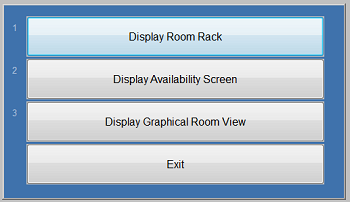 The room rack, shown below, is the quickest. 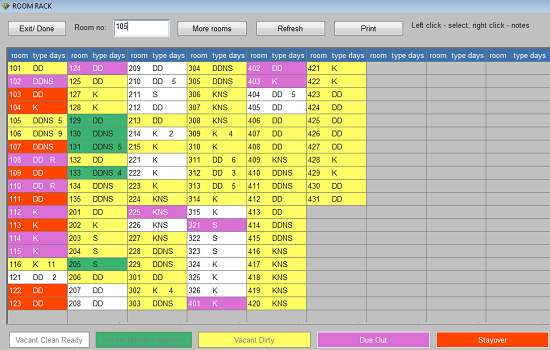 Each room is color-coded and shows the number of nights available. Just click the room you want or type the number and press Enter. Some people like the Availability Screen, shown below. Use your computer keyboard's down-arrow or click the room you want and press Enter. 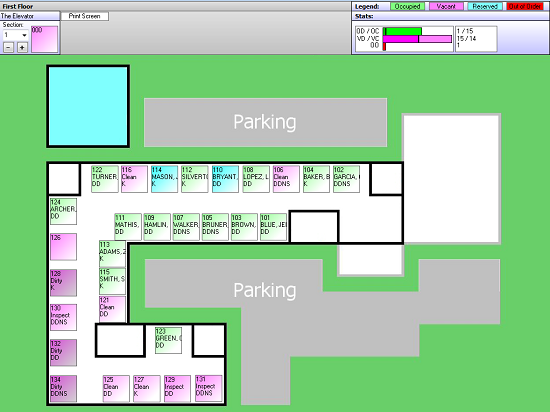 The graphical room view shows a layout of your property with availability and status color coding. 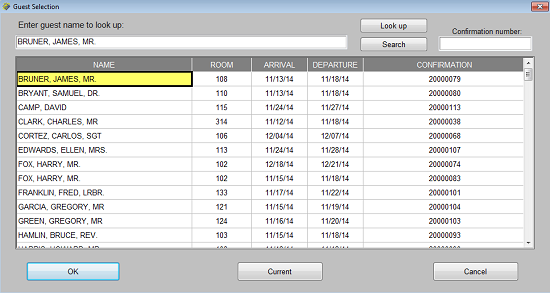 Each floor or section can be set up and viewed separately, with a dropdown "section" selection. Click the room to assign to the guest. 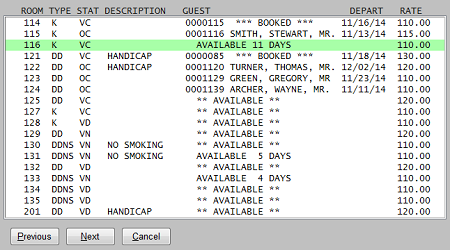 Several things factor into the room rate, including season records, room setup, number of adults, and rate code. If the rates change during the guest's stay, based on season or weekend settings, the changes are reflected in the "view/edit" grid as shown below. This is where you should make rate changes. It is important that you have a policy for credit card preauthorizations or payments at check-in. These policies are set in the Parameter Record and should be determined prior to going live with Execu/Suite. See Parameter Record Setup. "Type payment" is a required field. If blank, press Enter to look up valid payment types. Otherwise click the magnifying glass lookup icon. Select the correct payment type. If you are preauthorizing a credit card, click the "authorize card" button. Answer the prompts as they display. See also Check-in CC Preauth Video for a tutorial. NOTE: If you preauthorized a credit card, do not fill in the "credit limit" field. This will automatically populate with the amount preauthorized. If your policy is to post payment at check-in, DO NOT click "authorize card". You should NOT both authorize a credit card and post a credit card "sale" transaction at check-in. If you select payment code DB the system will prompt you for a valid City Ledger (Direct Bill) account. If the guest needs two folios, answer "Y" to "Split folio". You will be able to authorize credit card or second credit card, or set a separate credit limit. This is common at hotels with wholesaler guests, where the wholesaler pays for the room and tax charges with a "virtual" credit card and the guest is responsible for incidentals. The guest can be given the secondary folio with incidentals, and the primary folio will contain the room and tax charges which you might not wish the guest to see. If you are not using Guest Profile but would like to enter an email address for the guest, select the Options button at the bottom of your check-in screen. Then enter the email address in the appropriate field. Save the check-in prior to emailing a folio or other form. You can click the Options button if you want to enter a Travel Agency code and was not entered when the reservation was made. 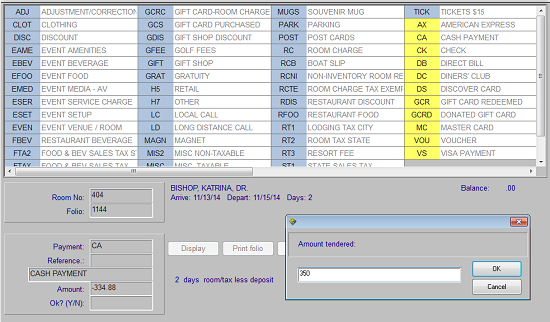 When you save the check-in, the Autopost window will display if your property has auto-post charges. Select the item for it to post the guest during "Post Room and Tax" at night audit, or deselect the item for it not to post. If your Autopost Setup popup includes a dropdown for quantity, select the appropriate quantity. Note that although you can create up to 20 Autopost codes, you may only select ten per guest. 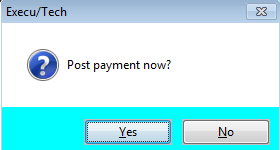 Depending on your Parameter Record settings, the "Post payment now" prompt will display. If you answer Yes, the Post screen will open. Remember, DO NOT post a payment at check-in if you preauthorized a credit card. 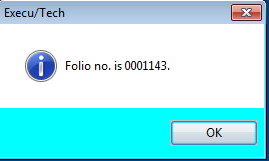 The only exception is when there are two folios ("Y" to "split folio?"). Only then may you preauthorize one folio's credit card and post a payment to the other folio's credit card. The default is for the prompt to display only for CA guests. The payment window will open, with the payment code and room & tax charges populated, as shown below. A Parameter Record setting determines whether the total room and tax charges or just one night's room and tax charges will default. 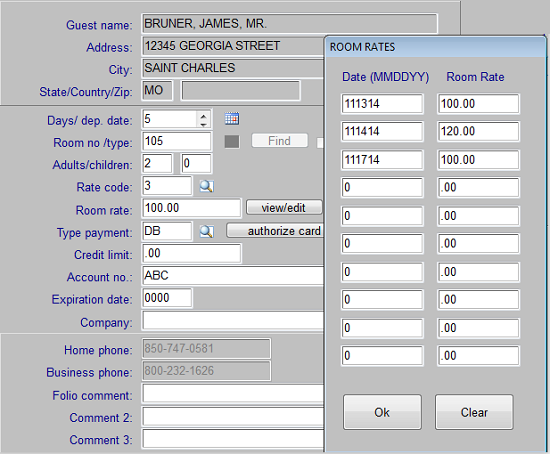 With a cash payment, "Amount tendered" will popup allowing you to enter the actual amount handed to you by the guest. DO NOT put this amount in the "Amount" field, as this is the amount owed to you, not handed to you. A popup will let you know how much change to return to the guest, eliminating math errors. This will complete the check-in process. Alternatives: You also may check in a guest from the Tape Chart or from the Graphical Room View or from People/Profile. Click on the Check In icon at the top of the main Hotel screen. The Profile Entry and Lookup screen will open. Type all or part of the guest name to see if an existing profile exists. If so, select it. If not, type the entire name and click "Create Guest Profile". Enter the information and save the profile. The check-in window will open. Enter the information as explained in the previous section. You may preauthorize a credit card at check-in or you may post a payment (credit card "sale") at check-in. DO NOT DO BOTH. A preauthorization sets aside funds, reducing the guest's available funds to use elsewhere. These funds are set aside for you. At check-out, you will post a payment against these funds, releasing any additional funds authorized. See tutorial video on preauthorizing at check-in. You may post a credit card sale at check-in. If the parameter record is set to "Y" to "post payment now" the system can take you straight to the Post screen, allowing you to post the payment. This will immediately post a "sale" transaction to the guest's card. See also Credit Card Procedures. 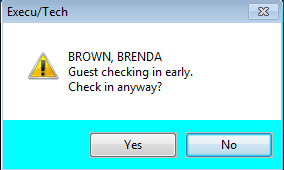 This message displays when you check in a guest between midnight and 8am. If you answer "Yes" the check-in date will show the previous date. If "Post room and tax" was already run at night audit for yesterday, remember to post them manually. 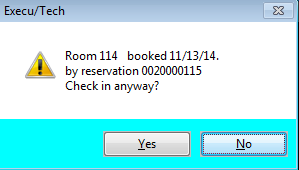 This message displays if you check in a guest with a reservation having an arrival date after the current date. 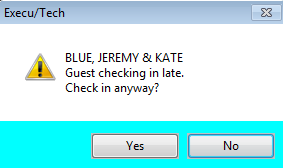 This message displays if you check in a guest with a reservation having an arrival date prior to current date. This will not display if you do not have "days to hold no-show reservations" set in the Parameter Record. This message displays when you change the name field in a profile. Note that ALL reservations and folios associated with this profile will reflect the NEW name and the OLD name will not exist. Certain changes display a message that the change has been logged. These changes include room reassignments, rate changes, and credit limit changes. This may display at the completion of a guest or master folio check-in. This may display at the completion of a guest or master folio check-in. Your Parameter Record setting determines this. This displays after a cash payment has been posted and a figure entered into the Amount Tendered popup. 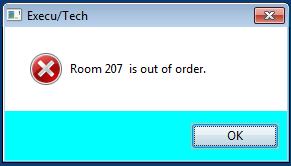 This displays when you try to check a guest into an already occupied room. This displays if you try to check a guest into a room with a reservation for any or all of the days required by the guest you are trying to check in. This displays when you try to check a guest into an out or order room. This displays when you try to check a guest into a dirty room. If you do not want this message to display change the "enhanced housekeeping" setting in the Parameter Record per instructions. 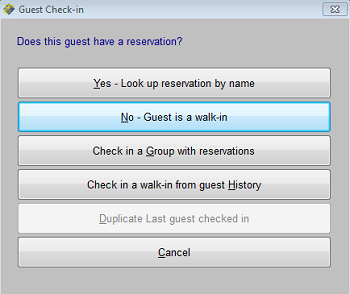 This displays if you check in a reservation and assign a room not of the same type that was reserved. The system will not change the rate automatically since a room reassignment does not mean an automatic rate change, such as when a room was unavailable and the guest was upgraded at no charge. See also "Errors and Fixes ". Click HERE for information about share-withs (two or more guests sharing a room, each guest having separate reservations and folios). Click HERE for Group check-in procedures.